First, let me explain. 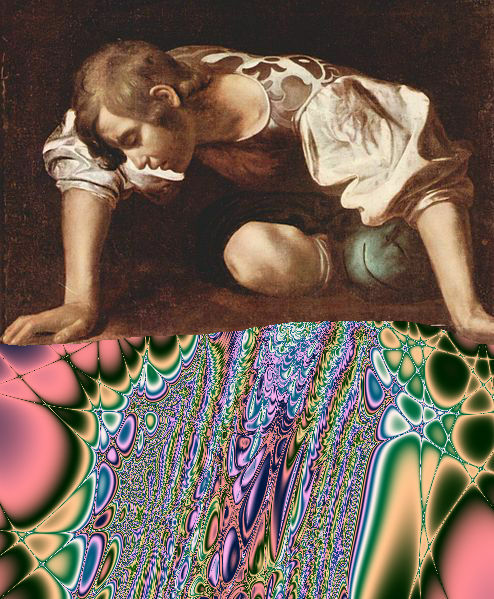 I make such a bold statement not because I hate fractals (or fractal artists) but because I love fractals and include myself among the hopelessly deluded. I came to this realization in a rather unexpected way: through rediscovering the joy of fractal artistry. For the last year or so all I’ve been doing as far as fractals are concerned was merely reviewing other people’s artwork as well as attempting to understand and explain fractal art from a theoretical, art criticism, point of view. I hadn’t really been making any artwork myself for over a year. Then just this past weekend I rediscovered the joy of fractal artistry. Like most computers mine has a screensaver and like all screensavers they only display when you’ve stopped using the computer for some length of time. Only then, when you’re not using them do they appear. 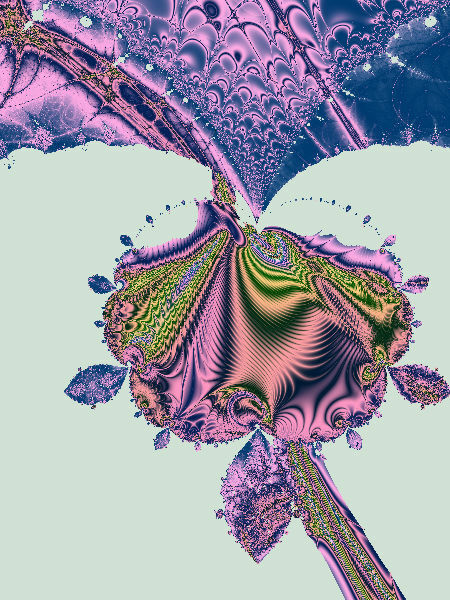 From time to time my computer would start drawing Lyapunov fractals in a screensaver called XLyap by Ron Record (1997). I had never thought Lyapunovs were very creative until I saw them rendered in the primitive, colored greyscale method of XLap. I became re-enthused with Lyapunovs after seeing their artistic potential demonstrated. I was already somewhat familiar with Lyapunovs from using Sterlingware, that great fractal program by Stephen Ferguson. I remembered the Lyapunov formula section in Sterlingware and thought it might be worth checking out one more time because if this screensaver, XLyap from 1997 could make interesting stuff out of Lyapunov fractals, then surely that powerful troika of: me, Sterlingware and a graphics program, could do even better. 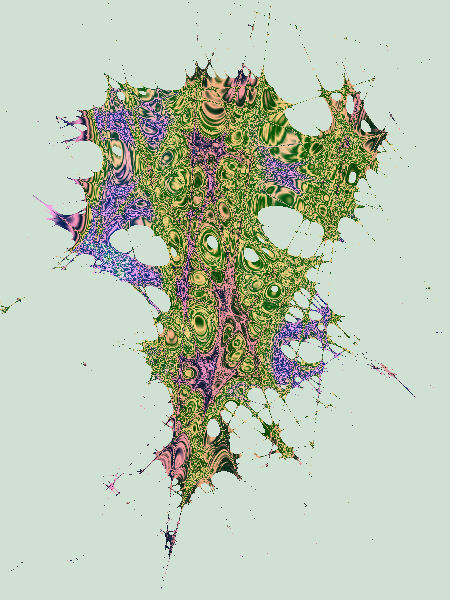 How can fractals be so engrossing to make and yet look so awkward as art? Awkward, because surely, to an outsider, that is, someone not initiated into the arcane world of fractal graphics, it’s all just technological weirdness (“Awesome! How did you make that?”). I mean, they’re not something like a portrait painting or a misty morning photograph of “park bench and trees” that makes almost anyone stop and make an instant emotional connection with the intent of the artist who made it. Fractals are more like Rorschach tests and the viewer’s reaction says more about their own insanity than that of the artist’s. So what does that suggest about fractal art as an art form? (More analyzing) It suggests something disturbing which I’ve sensed for some years now: the audience for fractal art is fractal artists. And when some of those fractal artists get together and try to get the rest of the world to discover fractals and “see the light” they unwittingly reveal the depth of their own narcissism and the subsequent flood of delusional thinking that causes them to believe that all people from every tribe and tongue will join them in worshipping fractals if only we can distract them for a moment and get them to look at some really great examples of fractal art. The promotion of fractals as an art form requires religious zeal and a faith in fractals that transcends reality and is able to calmly walk across the coals of art criticism (and self-criticism). Why else would anyone push this stuff? Back to reality. Fractals are the Rorschach Tests of our generation but since in our generation everyone is an authority, the diagnostic tests have been developed by the mental patients instead of the doctors and being crazy, we, the patients, have hung them on the wall as art instead of hanging them on the end of our hospital bed as charts that display the severity of our disease. I suggest a name change: since fractal art is really rock collecting and rock collectors call themselves “rock hounds” let”s stop calling ourselves fractal artists and instead use the term, “Fractal Hound”. 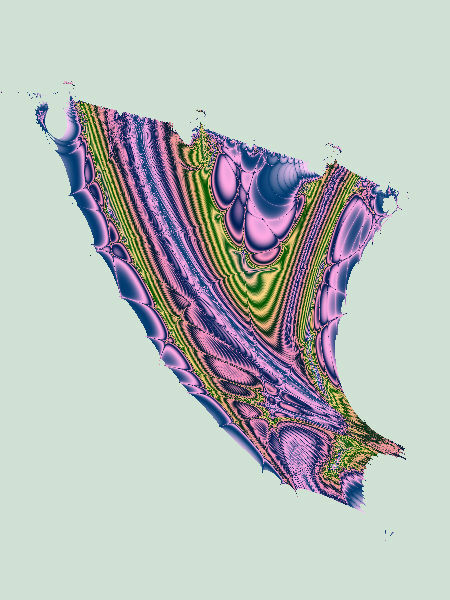 For example: The Benoit Mandelbrot Fractal Hound Exhibition. Our official symbol won’t be a spiral it’ll be a wheel barrow. In case I’ve failed to make a coherent point in this posting, let me end with something straightforward: fractal artists (I mean hounds) need to take themselves a lot less seriously. We have an oddball art form that doesn’t do what most art does. It’s a niche art form and appeals to the typical niche dwelling life forms like spiders and cockroaches. Our audience is us. Your audience is you. And it wouldn’t surprise me if my audience is me.And now, back to staring in the pool.